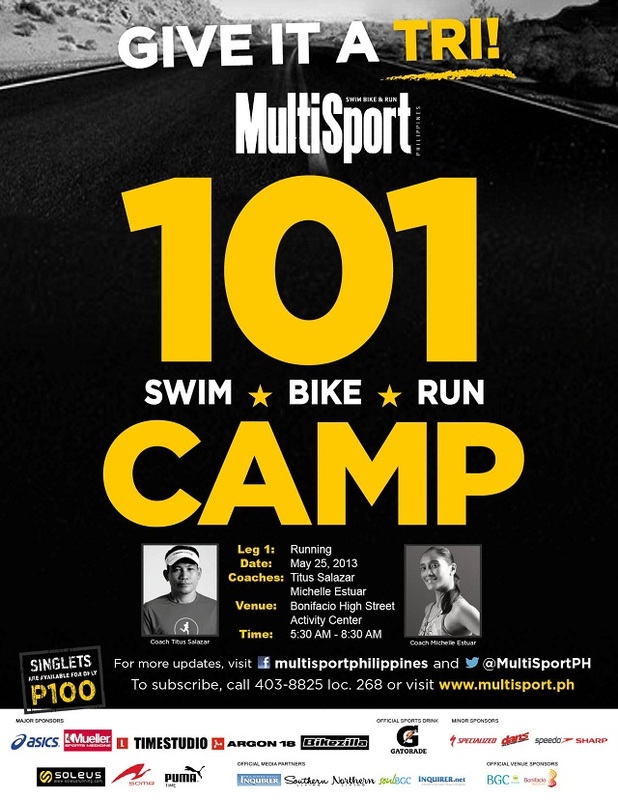 Learn how to Swim, Bike, Run at MultiSport 101 Camp 2013. The first Running leg kicks off this Saturday, May 25, 2013 from 5:30 a.m. – 8:30 a.m. at Bonifacio High Street Activity Center with Coach Michelle Estuar and Coach Titus Salazar. Registration is FREE*! Registration is ongoing until Friday 5:30 p.m. Now give it a TRI and register! 2 Wait for the confirmation e-mail of your registration within 24 hours. Not a subscriber yet? Get your one-year subscription now and have the opportunity to participate in this exclusive event. Call 403-88-25 loc. 268 for subscription details and loc. 215 for registration inquiries. You may also opt to pay for your subscription on the day of the event, simply indicate that you will be paying on-site in your registration e-mail.